Email marketing can lead to phenomenal results – provided you follow some basic rules when you run your email marketing campaign. If you are interested in carrying out successful email marketing, read ahead! Avoid the mistakes made by most email marketers and take a look at these simple and effective email marketing tips! A lot of times email marketers get so caught up in making their newsletters and marketing messages look attractive and compelling that they lose sight of their goal. They end up creating a beautifully designed marketing message that conveys absolutely nothing. The reader notices its aesthetic beauty and feels inspired to so something – but unfortunately there is absolutely no call to action! The marketing newsletter or message fails to guide the reader in terms of what the reader is supposed to do. Should the reader click on something? Should he follow a particular link? Where should he place his order? These are all important questions that need to be answered right at the start of the message. The focal point of an email marketing message is that it should spell out clearly what the reader of the message is meant to do, and how the reader should do it. It is also important that readers are made aware of what they will gain when they click through. This can be explained as simply as placing a ‘click here for 35% off on your next purchase’ link. MS Outlook and other huge email clients provide readers with a preview of the email that has been selected in their inbox. 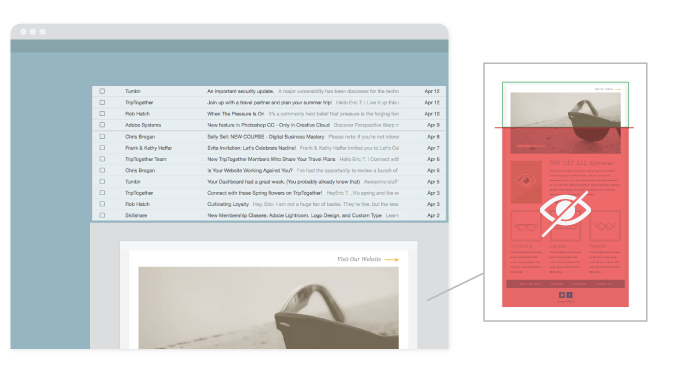 The preview pane shows the reader the extreme top of your email message. For this reason it is vital that the top part of your email is exciting, interesting, attention grabbing and successfully induces the recipient to read further. Personalization is one of the simplest tools for increasing your reading and click thru rates. Think of it this way; if you were out in public somewhere and you heard someone shouting, “Hey, You!” would you bother to turn around and acknowledge the shouter? No, you wouldn’t. However, if that person shouted, “Hey, (your name)!” you would certainly turn around as you would think the person calling out your name knows you. This principle holds true when it comes to emails. It has been seen that simply starting an email with the reader’s name can increase reading and click-thru rates significantly. So, benefit from this fact and always personalize your emails. One of the easiest ways to increase your list is to get more people to sign up for your newsletter. This may sound like a case of easier said than done, but if you have a website, this goal really is very easy to achieve. All you have to do is ensure that you place a sign-up box on each and every page of your website, instead of just on your homepage. The reason for this is that not everyone accesses your website from your homepage; a lot of people happen to come across a random page of your website and may not know what or where your homepage is. Such people should be able to easily sign-up regardless of which page of your website they are on. You should also see to it that the sign-up process is short and extremely simple; this motivates visitors to sign-up faster. 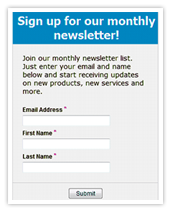 People are reluctant to sign up for newsletters as this involves giving away their email address. Nobody wants to be a victim of spam and people prefer to be cautious and protect their email addresses by simply not signing up. Your job is to motivate such people to part with their address by providing them with an excellent newsletter as well as a little extra something - a bonus. White papers and detailed case studies for those who have already subscribed are great bonuses. New subscribers can be temped with a special newsletter edition or a humorous Winamp skin. These are just suggestions; there are plenty of other options when it comes to offering a bonus. However, it is important to keep in mind that whatever the bonus is, it should be relevant to your newsletter. An email is a passing phenomenon. It is something that needs to be constantly conveyed to its readers on a fairly frequent basis. Failure to send your newsletter often enough will result in disaster; your subscribers could easily forget you, you could lose your readers to your competitors and your emails may be considered spam. It is important that your newsletter is always punctual. It is not enough that you send a weekly newsletter once a week or a monthly newsletter once a month. You need to ensure that it goes out on the right day at the right time. Let’s say you have a weekly newsletter that you sent out on Friday at 4 p.m. You need to ensure that your newsletter reaches your recipients inbox every week, on Friday and at 4 p.m. This will prove to your readers that you can be trusted. It does not matter who you are sending your email to; what matters is that your website URL as well as your email address is an inseparable part of your signature and makes its presence in every single one of your emails. Providing these details in your email signature is instant advertising and effectively lets all those who get your emails know that you are online – they let people know that you exist. If you pay attention to these tips, you are sure to get better results for your email marketing efforts. So make sure you put these tips into practice when you embark on your email marketing journey! Very informative and cutting edge.